Bright fun colors and “Nite-Glow” designs for safety. Constructed of premium Single layer nylon webbing. 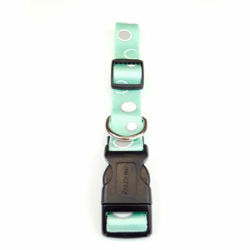 Features quick release buckle and an End D ring. 1” wide collar adjusts from 16” to 26”. 3/4" wide collar adjusts from 14" to 22".